The Penn State administration had finally hatched a plan. It was too kind, backward and included possibly tampering with a criminal investigation. Still, it was enough of a plan that it could've stopped Jerry Sandusky, child molester, back in 2001. Just a couple weeks earlier, a football graduate assistant, Mike McQueary, had witnessed Sandusky abusing a boy in a Penn State locker room shower. He told coach Joe Paterno. He told vice president Gary Schultz and athletic director Tim Curley. He could've been more specific. He was clearly specific enough, however, to get their attention. Schultz plotted out a course of action, according to a bombshell report by CNN, citing an email exchange that's been uncovered in the school's independent investigation by former FBI chief Louis Freeh. The report could be released as early as next month. According to CNN in an email dated Feb. 26, 2001, Schultz wrote to Curley about a three-part plan that included talking "with the subject asap regarding the future appropriate use of the University facility," … "contacting the chair of the charitable organization" and "contacting the Department of Welfare." It would have been better to skip directly to the third action and let the welfare authorities do the meeting and informing, but this should've been enough to end Sandusky's reign of terror. Except that Curley sent an email to Schultz and school president Graham Spanier on Feb. 27, 2001, that changed everything. "After giving it more thought and talking it over with Joe yesterday, I am uncomfortable with what we agreed were the next steps. I am having trouble with going to everyone but the person involved. I would be more comfortable meeting with the person and tell them about the information we received and tell them we are aware of the first situation," Curley's email said, according to CNN. It's unclear why Curley suggested that Sandusky (the "person involved") wouldn't be contacted when Schultz's email told Curley to "talk with the subject asap." But the bottom line is that child welfare services was never contacted. And Sandusky, convicted earlier this month on 45 counts of molestation, continued to stalk and abuse the area's disadvantaged boys for seven more years. The email is devastating on multiple levels, perhaps most for Paterno, who had escaped some measure of scorn thus far by having played the, in-hindsight-I-should've-done-more angle. Paterno, who won more games than any other major college football coach, died at age 85 in January of lung cancer. According to Curley's email, Paterno participated more than he ever admitted, including likely talking Curley – and thus the others – out of the plan to turn Sandusky over to authorities. Take a second for that one to sink in. It is now perfectly reasonable to postulate that Joe Paterno protected Jerry Sandusky, who had been a Penn State assistant coach from 1969 until retiring in 1999. Sandusky went right along with his business of showering with boys in the locker room, of bringing kids to the sidelines during games, of sitting in the press/luxury box area of home games. Sandusky used the program's allure like a lollipop to draw kids into his van. Paterno will never have the chance to defend against this charge or answer these troubling questions. However, what would be his defense? The first could be that he and Curley never met on or about Feb. 27, 2001, or if they did meet, Sandusky wasn't mentioned. In a 2011 appearance to the grand jury, Paterno said McQueary detailed what he saw in the shower. Within a couple days Paterno relayed the story to Curley over the phone. He said he wasn't involved in the investigation after that. "Because I figured that Tim would handle it appropriately," Paterno testified on Jan. 12, 2011. "I have a tremendous amount of confidence in Mr. Curley and I thought he would look into it and handle it appropriately." Curley's email tells a different story, that he discussed with Paterno the plan to bring in child protective services. Perhaps Curley lied in that original email, although why is anyone's guess. Perhaps Paterno forgot about the meeting (a decade had passed by the time the then 84-year-old testified in front of the grand jury). Or perhaps Paterno was trying to cover his tracks by not mentioning it under oath. The other possibility is that the meeting did take place and Paterno supported turning Sandusky over to child welfare but Curley, after "giving it more thought," overruled Paterno's position and changed direction. That one is difficult to believe. Tim Curley was Joe Paterno's boss in title only. Curley grew up in State College in a house just down the street from the current Beaver Stadium. He parked cars and sold programs as a kid. He played football at Penn State and was said to be JoePa's handpicked choice as athletic director years later. Tim Curley, like so many in State College, stood in awe of Paterno. Forget the organizational chart, he worked for the coach more than the coach worked for him. The notion that he would ignore Paterno's advice, and then upon doing so never have Paterno question him or later overrule him, is highly unlikely. There are more details to be sifted through. One is Curley cryptically mentioning he would "tell [Sandusky] we are aware of the first situation." This seemingly refers to Sandusky being investigated by Penn State police in 1998 for abusing a boy, later known as Victim No. 6, in the showers. 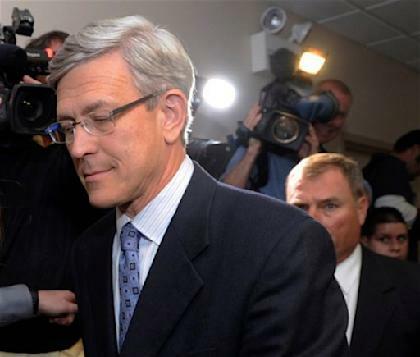 The Centre County district attorney at the time chose not to prosecute Sandusky. While most believe there could be no way that Curley, Schultz and Spanier, let alone Paterno, didn't know about the 1998 investigation when choosing not to act in 2001, this is a smoking gun. It establishes that at least the three administrators did know. And wouldn't Curley have brought it up when discussing Sandusky with Paterno? It's the most galling and evil part of the CNN revelations. These officials were learning of a second allegation that Sandusky had abused a boy in the showers and yet their reaction wasn't to turn the case over to authorities. Instead they allowed Sandusky to continue to operate on campus, only with the caveat he wasn't supposed to bring children around, an order he routinely violated. After 1998, you could argue there wasn't much they could do. There was an investigation but no charge. People who work with children are always in fear of such a thing. If the district attorney said there was nothing to it, then you accept there was nothing to it. Until a similar accusation is made, this time not from a possibly confused kid, but from McQueary, your own 27-year-old, no-reason-to-invent-such-a-story graduate assistant. In 2001 there was zero excuse to not stop Sandusky. Zero. Penn State's decision was pathetic. It's a chief reason why Curley and Schultz are facing prison time for failure to report a crime. It's also why Spanier remains a candidate for similar indictment from the attorney general. Did Spanier realize the stakes of his decision? You bet he did. His email back to Curley concerning not going to child welfare says as much. "I am supportive," Spanier wrote, according to CNN. "The only downside for us [is] if the message isn't heard and acted upon, and then we become vulnerable for not having reported it." Graham Spanier is a bad person. That wasn't the "only downside" or even the primary downside of Sandusky not hearing "the message." The fact that additional children would be abused was the downside. Spanier, ever the self-obsessed top administrator, cared only about his own liability, not some terrified 10-year-old in an empty shower room. At no point, apparently, did anyone write an email about finding the boy McQueary said was being molested. What remains is the question of why otherwise reasonable people would make such an ethically bankrupt and criminal decision. These are highly educated, high-functioning men. The answer may never be determined. It may help to go back to that moment. In hindsight, the smart move would have been to have Sandusky arrested. Viewed from today, Curley, Paterno, et. al. would have been lauded for making the correct decision. At the time, however, the story would've been about a recently retired defensive coordinator molesting kids in JoePa's locker room. Paterno was 74 and coming off a 5-7 season. He didn't have much of a team for the foreseeable future, either. Rumblings were growing that it was time for him to retire, that the game had passed him by, that at his age he couldn't handle the responsibilities of a major college football program. An act of child molestation in the locker room would have only fueled that. When word would have eventually leaked out that in 1998 Sandusky had been investigated for the same charge yet still maintained all-hour access to the facilities, it may have too much for Paterno to survive, let alone explain. In the precise moment, each of the men must have feared being fired. Even Joe Paterno. Perhaps that wasn't the case. We may never know and it certainly isn't an excuse for allowing Sandusky to continue. It may explain it, however. Self-preservation is a powerful motivator. If Sandusky had sought the help they suggested, had he stopped his behavior, had the school not commissioned Louis Freeh to dig through every scrap of information in the football program, a witch hunt that found its witches, they may have gotten away with it. They didn't, though. Instead, the whole thing gets worse for Penn State. The full report looms. The noose tightens on Curley, Schultz and Spanier. And Joe Paterno, the beloved saint of the Nittany Lions, is left looking nothing like the man everyone believed he was.